Located in the business district of Chamartín to the north of the city, the Santiago Bernabeu Stadium is the home of Real Madrid. The stadium’s history dates back to 1947 when the first ever match was played there, Real Madrid beating the Portuguese team Os Belenenses in the inaugural fixture at what was then known as ‘Nuevo Estadio Chamartín’. It wasn’t until 1955 that it adopted its current name in honour of the club’s president. The original capacity of around 75,000 was increased to 125,000 in the mid-1950s which lasted until the 1980s when it had to be reduced to around 90,000 during major developments geared to preparing the stadium for the 1982 World Cup when it hosted the final in which a Paolo Rossi inspired Italy beat West Germany 3-1. The 1990s saw major redevelopment largely enforced by new safety regulations which resulted in the overall capacity rising to 110,000. This is also when the entrance towers appeared on the four corners of the stadium. Further UEFA rules with regard to all seater stadiums led to the capacity falling at the end of the decade to a little over 75,000. Following the arrival of Florentino Pérez as club president in 2000 enormous investment went into improving the stadium which not only made for a better spectator experience but also ensured that the club earned the maximum revenue from their facilities. It was during this period of that the club created its museum and started offering stadium tours which have become one of Madrid’s major tourist attractions. Today the capacity is around 85,000 but plans have already been unveiled to raise this to 93,000 with a retractable roof. El Estadio Santiago Bernabeu lies in the north of the city just off Paseo de la Castellana. There are various means of transport for getting there. Bernabeu by Metro – Many visitors who stay down near Puerta del Sol and Gran Via choose to walk up to the ground though be warned it will take you around 45 minutes. If you don’t fancy the stroll then underground is the most common way of getting there. 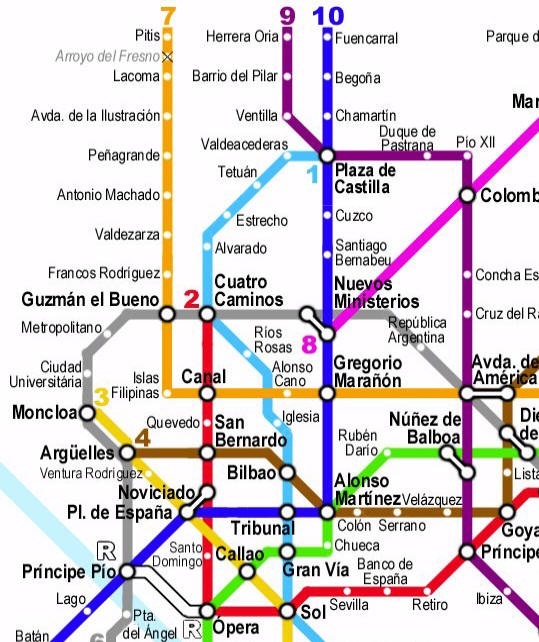 Get on the dark blue line 10 in the direction of Fuencarral and get off at the Santiago Bernabeu stop after Nuevos Ministerios. Get off at the Santiago Bernabeu stop just after Nuevos Ministerios if you're travelling from the city centre. Bernabeu by Bus – Buses run up and down Paseo de la Castellana all day and night. Numbers 14, 27, 40, 43, 120, 147 & 150 all stop outside the stadium. Taxis to the stadium are easy to find though there always seems to be a shortage straight after the match so it’s wise to go for a beer in a local bar and let the crowds disappear before looking for one. Bernabeu by Train – If you’re staying some distance away or are specifically coming into the city for the match then you should check out the local train network known as the ‘Cercanías’. The nearest train station is at Nuevos Ministerios which is only a 10 minute walk from the ground. Real Madrid’s stadium tour is a must for all football fans visiting the city. It is one of Madrid’s most popular attractions. The visit includes a panoramic view of the Stadium from the main stand which comes off the museum, entrance into the Presidential box and changing rooms and entrance to the player’s tunnel, benches and coaching area. You can also go up to the playing area but not on it, visit the trophy exhibition and do some shopping at the official store on your way out. Access is restricted to some areas if you visit on a match day. Matchdays: The Bernabeu Tour and museum visit is open on the day of matches but closes 5 hours before kick-off. The dressing rooms aren’t accessible. Only the trophy room can be accessed in the two hours before kick-off so you’re well advised to plan your visit on a non-matchday if possible. You can confirm opening times and entrance ticket prices on the official Bernabeu tour webpage. You can buy tickets next to Gate 7 near the centre of the stadium on the side of Paseo de la Castellana. For convenience sake you can pre-order Bernabeu Tour Tickets along with a city tour and print them out before travelling. Occasionally there are closed training sessions on the pitch in which case the tour will be closed during its duration. Visitors are informed before buying their entrance tickets. If you’re buying tickets for Real Madrid then you’ll want to get some idea where you’ll be seated. The following seating plan should help you out. Leaving ticket purchase until the last minute, especially for big games, isn’t recommended as you might find yourself haggling with a ticket tout to get into the match. Do not believe the tout when he shows you a seating map of the stadium and tells you what great seats he’s selling you. There’s every chance that you’ll be in the ‘nosebleed seats’ whilst he’s trying to convince you that you’re almost at pitch level. For peace of mind it’s a much better idea to order your match tickets from a reputable supplier such as ourselves. If you’re taking a city break to Madrid for the weekend and going to see a match whilst you’re there then don’t stay near the stadium as the majority of the tourist attractions are located around Puerta del Sol and Plaza Mayor so you’d be far better off staying in that part of town. If, however, you’re only here for a limited amount of time and specifically for a match then there are. some good hotels very near to the Bernabeu. The Holiday Inn is a particularly good choice being located just across the Castellana from the stadium with a great swimming pool on the roof. 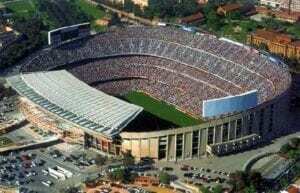 The Nou Camp Experience is Barcelona’s 2nd Most Popular Tourist Attraction. 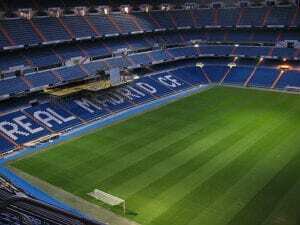 An Essential Attraction For Football Fans is Real Madrid’s Santiago Bernabeu Stadium Tour.